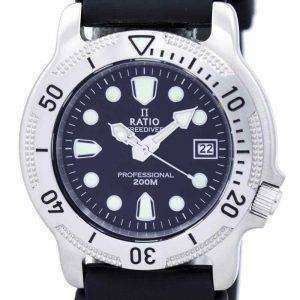 Oh, Ratio II FreeDiver! 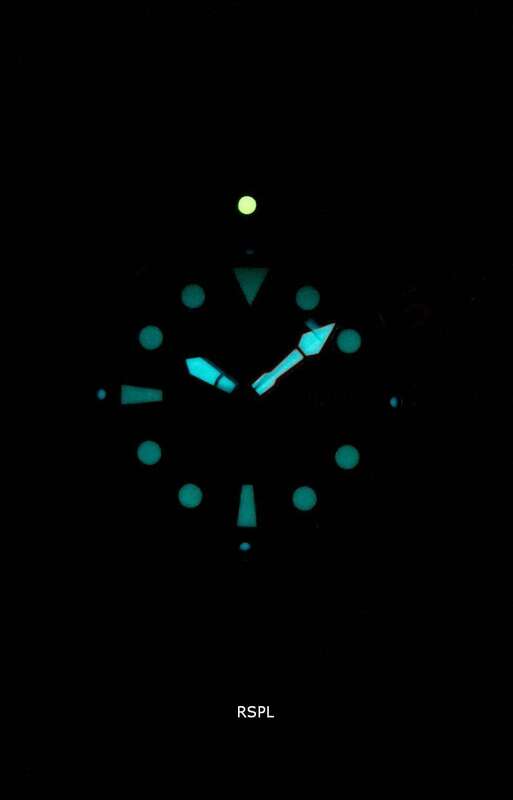 You held us (and still hold even after so many days of your entry to the horological universe) spellbound with your magical deep-diving features despite being destined to adorn the wrists of free divers going to shallow depths without oxygen support. 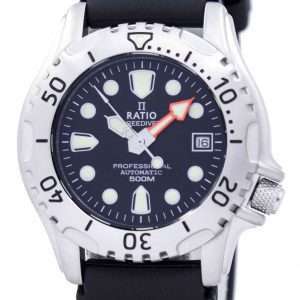 You drew newbies and the veterans to your bold lines and sheer heft alike; your unusual styling within the diver parameters removes the possibility of taking chances; there’s no other diver that can offer the professional specs in their real sense at such a nominal price. 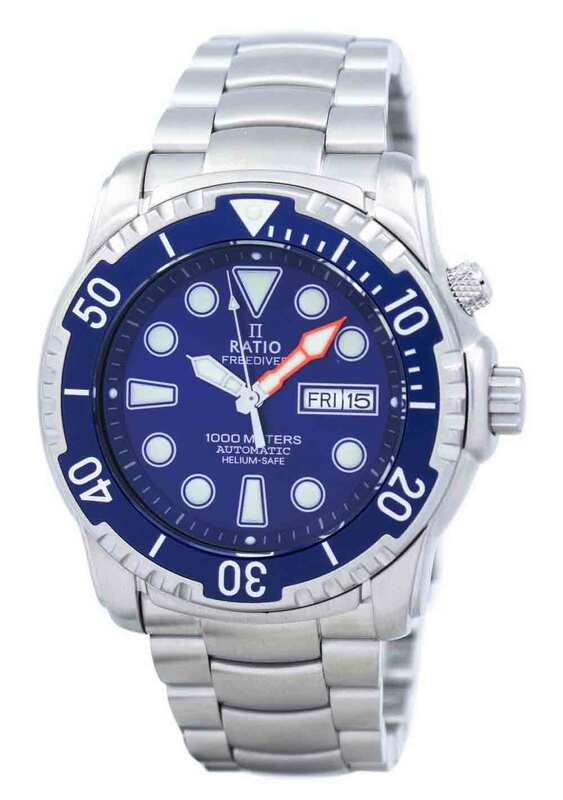 With that much said, please welcome the Ratio II FreeDiver Helium-Safe 1000M Automatic 1068HA96-34VA-01 Men’s Watch! That’s quite a mouthful. The FreeDiver is a big diver for sure! A big, fat piece that’s a lot more watch for the money; it’s built to survive brine, brutal weather and more than just a few bashing. 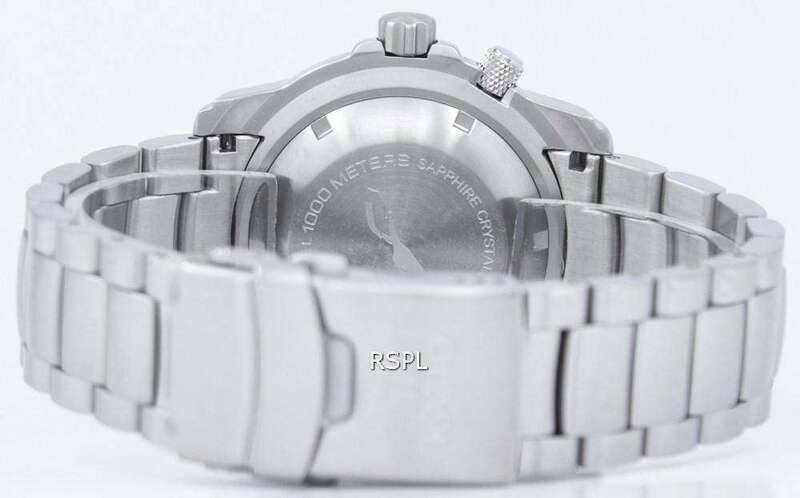 Looks cool, looks bold, looks bright; thanks to the shining stainless steel, flawless sapphire crystal, a brilliant loom on the syringe/arrow pair of hands and a tough, polyurethane rubber band providing a comfortable, snug fit. The date window is well-defined; the date reads clear and sharp. 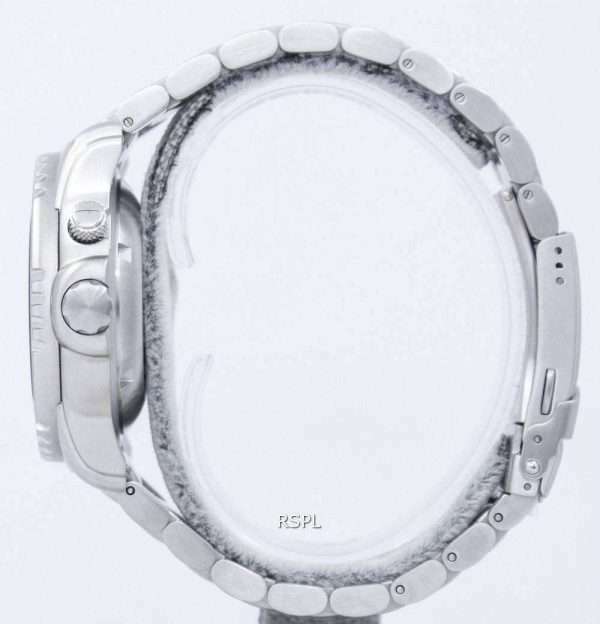 The unidirectional, nice, fat bezel is fun to turn and works as a countdown timer to time your dives. The big, fat hands offer an amazingly clear view against the large dots and quadrant markers, even amidst dark, murky waters. A screw down, cylindrical 4’o clock crown with guards to prevent wrist bite during strenuous, physical labor with hands. The crown has a well-raised surface texture to ensure a firm grip under slippery and wet, oily or watery conditions. 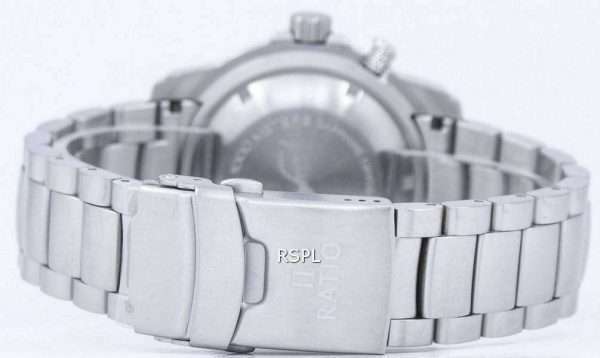 A trusted movement; the Seiko quartz caliber VX4E within an interestingly-shaped case, also housing the crown at 9 to operate the helium valve. It brings an extra touch of class. 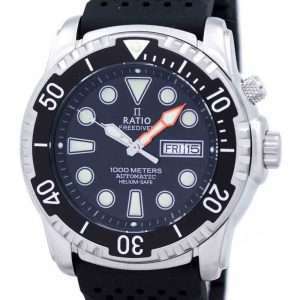 The Ratio II FreeDiver Helium-Safe 1000M Automatic 1068HA96-34VA-01 Men’s Watch comes for a fair price; almost half of what another pro-spec diver does. 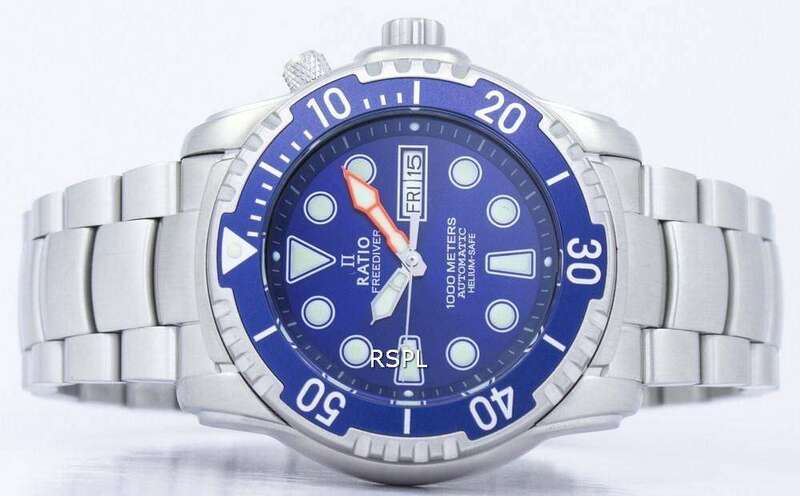 The Helium-valve is a rare phenomenon in diver watches on this side of the $500 mark; you pay almost another $500 to get that thing that really works. 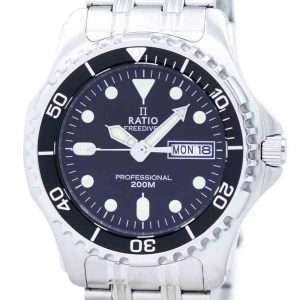 Those who haven’t found another worthwhile diver watch after the Monster or the Prospex/Marine Master till date must try the Ratio II Free Diver Helium-Safe 1000M Automatic 1068HA96-34VA-01 Men’s Watch. 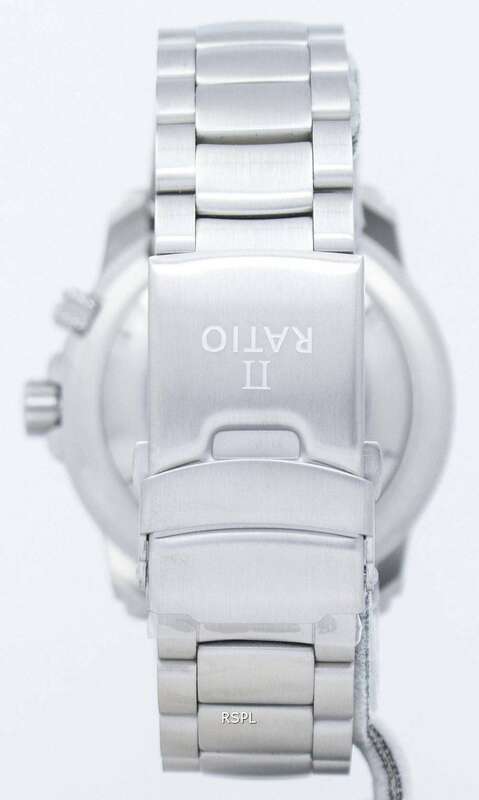 It’s athletic, not a hunk of steel knurled to glory! Freediving requires diving small to medium depths without the aid from aqua-lungs. 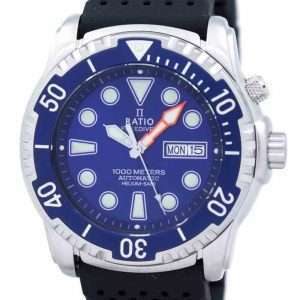 Your movement must be free and hence, you swim lighter than you would with SCUBA gear. 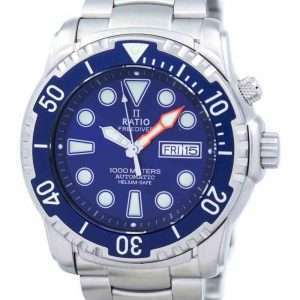 Even your watch should be light, strong and sturdy! Freediving is free from Helium accumulation. 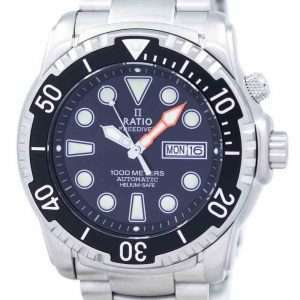 However, this one is equipped to handle the same in case you need to use pressurized diving apparatus for the descent. 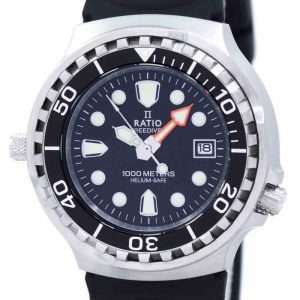 A freediving watch equipped to handle saturation diving if need be.